It's beginning to smell a lot like Christmas! The clean, lush scent of a Christmas tree, the sweet spice of warm gingerbread and the rich tang of mulled wine; we all love to smell our favourite festive scents during the holidays...but not-so-nice aromas also have a habit of lingering in the excitement-charged air! Whether they are nasty or nice, these 12 smells of Christmas all play a part in the festive season, but with Febreze's Christmas scents to hand there should never be a reason to let any stinky scents ruin your holiday buzz. So whether it is the sweetness of Vanilla Latte, the traditional warm infusions of Apple & Spice or Warm Cedarwood, the fresh fragrance of Winter Garden or a light spritz of Festive Spice, Febreze's new collection of seasonal scents are the perfect perfumed accessory to keep your home smelling just right this Christmas. 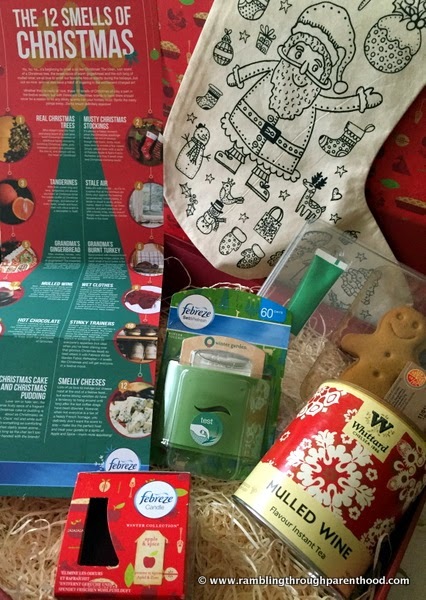 Febreze UK have kindly agreed to gift one of my readers a lovely 'The 12 Smells of Christmas' gift hamper similar to the one shown below. You can enter the giveaway via the Rafflecopter widget at the end of this post. Good luck! And have a lovely, fragrant Christmas. Disclaimer: I was gifted a hamper by Febreze UK to host this giveaway. No other compensation was received. I love the smell of gingerbread and I am not so keen on the smell of Christmas pudding! I like the smell of pine needles. I love the smell of the dinner roasting but not the musty Christmas hat that came down from the loft! Oh probably fresh smell of real Xmas trees....worse smell is when the in laws leave on Xmas day and the house smells of cigarette smoke!!! The wonderful smells of yankee candles, I have a christmas tree tart burner and oh my it's wonderful! I'd rather not smell a burnt turkey!! I love the smell of cinnamon and cloves, Hate the smell of the sewage farm if the wind is from the west - not so bad now, but some Christmases past it's been vile. As the crow flies the works is only a mile away. All the local villages protested and report even got in a national daily newspaper. Living in the countryside is lovely, but not when you live near a sewage works!! Favourite smell is snow but I'd rather not smell the kids bums after Christmas dinner sprouts haha! My favourite smell is chocolate Yule log! I would rather not smell wet mouldy laundry when it won't dry! I love the smell of mulled wine but I do not want to smell fish! I love the smell of fresh Christmas trees. I'd rather not smell wet and dirty boots. I love the smell of real Christmas trees and hate the smell of turkey. My favourite is gingerbread and the worst is pine needles- it's like toilet duck! I love the smell of dinner cooking but I hate the salmon mouse my mother makes, yuck! i love mulled wine & oanges at christmas but keep those spout away from me!!!! Love smell of oranges but would rather not smell meat cooking. I love the smell of satsumas, & would not like to smell burnt turkey! Love the smell of dinner cooking but HATE the smell of the kitchen bin by the end of the day. I love the smell of Christmas trees (real ones) and I hate the smell of sprouts cooking. Mulled wine! I'd rather not smell any wreaths or flowers that have been picked. The real christmas tree, growing up in Australia we always had fake ones because of the heat. A burnt Christmas dinner is the worst, PANIC! Christmas Trees, the real ones. The worst has to be a burnt christmas dinner, PANIC! I loooove the smell of Christmas baking-spices and vanilla, ginger and cinnamon-but I hate the smell of sprouts and cabbage cooking (and the aftermath of eating them)! I love the smell of mulled wine and hate the smell of burning turkey or sprouts. Christmas baking is a lovely smell.... Sprouts is a no no - yuk!! Fresh pine and cinnamon baking. Not so keen on the smells our old dog makes though. Still, the old love can't help it. Sprouts is the worst, ham is the best, yum! I love the smell of the turkey cooking in the oven, I don't like the smell of Christmas Pudding, horrible stuff!! I love the smell of Christmas cake baking in the oven, and the worst smells come from my dad on christmas night after eating lots of sprouts and stuffing, euurrrrgh! Has to be the spiced apple candles. Hate the smell of people's unwashed coats (that particular musky smoky smell that just burns your face) as you inevitably end up squished next to them in a queue somewhere! Boak. My favourite Christmas smell is that of a freshly erected tree. It smells like pine - or at least something deliciously herbacious. I smell I dislike is that of cooking turkey - or any meat. Live the smell of mince pies baking, hate the smell from sprouts left on the plate! I love the smell of cinnamon at Xmas! I love the smell of turkey but I don't like the way the brussell sprouts smell whent they cook. Love the smell of cinnamon and hate the smell of brandy! Gingerbread is the best smell and Brusel sprouts is the worst! I love the chrstmas tree, I dont like sprouts.